What do you like to have on hand? So glad you will be sharing your recipes with us. YAY! I love this! 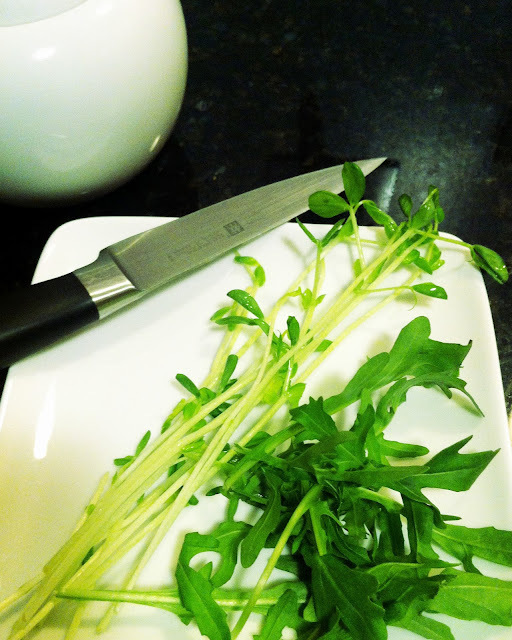 I've been too chicken to try pea shoots but after hearing that they're slightly sweet I'll definitely give them a try! I like to always have some cilantro and rosemary on hand - two of my favorite herbs! Yes, fleur de sel (flower of salt) is an excellent choice - has a mild flavor and courseness along with the "wet" feel. It's usually light grey or tinted pink (the pink is from a salt marsh). Pick the French made one if you find it in the store - it is slightly more expensive but better than the more commercial Portuguese-made one. Thanks! I love your blog. Its easy to read and looks very fresh and modern without all the clutter. Your photos are clear and pop too. Very simple but packs a punch. I think your wife is amazing, thanks for sharing your recipes. Thanks! And yea, I think she's pretty amazing too!